Creating time to research and pitch a guest post is hard. But the upsides are too good to ignore. Guest posting increases website referral traffic, improves search rankings, and expands brand awareness. It’s also a great way to build your personal brand and thought leadership. Ready to reap the benefits of guest blogging? Don’t let time-consuming outreach steps hold you back. 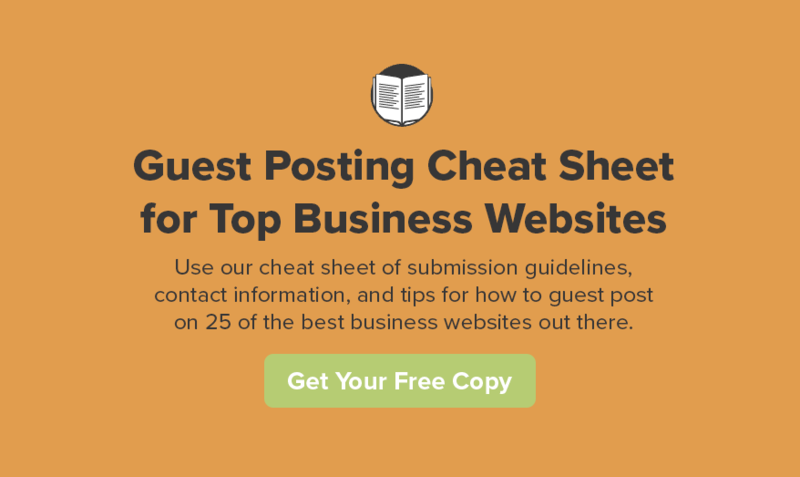 Download our Guest Post Cheat Sheet for Top Business Websites now! Step 1: Research websites and blogs that cover your industry. Research websites and blogs that cover topics in your industry. Business websites and news outlets are always a good bet for anyone in the private sector, which is why we concentrated our cheat sheet on that topic. However, more industry-specific blogs will most likely be more successful in driving website traffic that will engage and convert on your website. When building your list of potential places to pitch to, a tool like Buzzstream is useful for making data collection easier, more efficient, and organized. 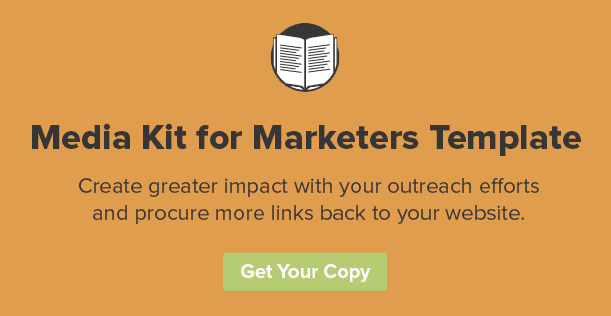 Want more recommendations for tools that can help with your outreach efforts? Check out our list of 176+ marketing tools! Step 2: Check submission guidelines. Submission guidelines are usually under the website’s contact information, about us section, or linked to their blog. If they don’t have submission guidelines, search for tips on submitting to that website on Google. If you are still unable to find the right information and have done your due diligence, try contacting their main email address to see if they accept guest posts. Note: We’ve done this work for you in our Guest Post Cheat Sheet. Download your copy to start guest blogging! Step 3: Write for their audience, not yours. When linking back to research on your brand’s website, try not to do it more than once and make sure it’s extremely valuable to the post you are submitting. Once you are an established guest writer and have a solid relationship with your editor, only then can you start to introduce your brand a bit, and link back to your website a little more often. You may be able to do this earlier on with publications that are directly relevant to your brand. Step 4: Follow the submission guidelines when pitching! Check the submission guidelines to see if the website accepts ideas or if they want you to submit a full-length post. Look for guidance on who to contact. If there is a specific email or form for submissions, use that. If not, find the contact information for an editor that covers the topic area you’re writing on. At the beginning of your email, comment on a recent story or series the editor, reporter, or publication has covered, explaining why it resonated with you. Make sure this story is related to the idea you’d like to pitch. If you have a hard time finding a relevant story, you may want to consider finding another person or website to contact. Introduce the idea(s) you’re pitching and very briefly explain why it’s important, relevant to that website’s audience, and why it’s timely. Mention that you have copied a brief outline of your idea at the end of the email. If you have been published before, write a very brief sentence or two explaining your credentials, and express how enthusiastic you are about potentially contributing to this website. Sign with your name and full contact information. Include your job title if relevant. At the end of the email, include a short, but specific, outline of your story for each idea in the email itself. Check the submission guidelines to see if the website accepts full-length blog post submissions or if they want you to submit ideas first. Look for guidance on who to contact. If there is a specific email or form for submissions, use that. If not, find the contact information for an editor that covers the topic area you’re writing on. Introduce the blog post you’re pitching and very briefly explain why it’s important, relevant to that website’s audience, and why it’s timely. Mention that you have copied the blog post at the end of the email. At the end of the email, include your original blog post, as well as a brief bio and profile photo at the bottom. Step 5: Nurture your relationship. Creating a relationship with editors and reporters is the key to your future guest posting strategy. If you get any response from a real person (not an automated email), be professional, helpful, and strive to impress. Anticipate their questions and needs, and be respectful of their time. Follow editors and reporters on social media. Like, share, and comment on on their posts. If possible, meet up with editors for coffee or lunch, and talk about what they cover. Connect with any members of the press you meet on LinkedIn, and be sure to exchange business cards. If you haven’t heard back in two weeks — unless their submission guidelines warn you about a longer wait — then be sure to follow up. Contact their main email address or a specific editor and ask about your submission. People are busy. Lend a helping hand by sending them a quick reminder expressing your eagerness to contribute to their website. If your guest post is very timely, then you may want to follow up even sooner. Even if you get no response, send an email thanking the editors and the website for their consideration of your piece after about four weeks (unless the website’s submission guidelines warn that you may have to wait longer). This gives you the chance to tell them that you truly hope you’ll be able to contribute in the future, but you’ll look to offer the piece to another website if you haven’t heard from them by a given date (say, by COB in two business days). Give them this last opportunity to respond, just in case they are in the process of editing your piece, but haven’t had the chance to notify you yet. Use Google Analytics, or another website analytics platform, to analyze referral traffic from your guest post to your company’s website. If you don’t know how, our Guide to Google Analytics will help you get started. Look at page views, new users, and goal completions as indicators of how this guest post contributes to your company’s website performance. Pay special attention to page views and goal completions, as some websites may be great at driving traffic, but not as great at driving conversions. If you have several guest posts or links on other websites, use your analysis of referral traffic to drive future guest posting decisions. Try to get placements on website that drive the most conversions on your website. Looking for a better way to do media outreach? Download our Media Kit Template for Marketers now!